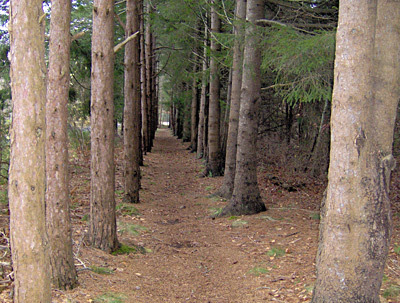 The Donald Whelden Preserve is a small, flat, wooded parcel that runs from Davisville Road to Green Pond in East Falmouth. Although it is only 11 acres, the preserve seems much larger because of the meandering paths, thick trees that shut out the sounds of traffic, and the long strip of Green Pond visible from the shoreline. The parcel is ¼ mile south on Davisville Road from the stoplight at Route 28. The small parking area is on the west side opposite Rosa Lane. The shore is a good place to look for wintering ducks from fall through spring. Unless the pond is frozen, visitors can almost always see small flocks of buffleheads, black ducks or red-breasted mergansers. In the spring, ospreys sometimes hunt here. The town purchased seven acres of this conservation area in 1989, in the early years of The 300 Committee. Four acres were added to the preserve when the town bought an adjoining parcel with Land Bank funds in 1999. The parcel is named for a young man who grew up in Falmouth and died in 1985 when lightning struck his home. Donald Whelden loved the outdoors, and donations poured into The 300 Committee office in his memory. 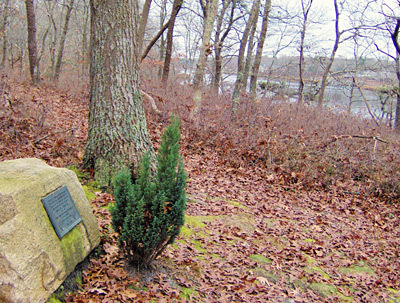 The land trust decided the peaceful setting of the property was a fitting memorial for him; contributions made in his name were used to help purchase the property. As it is today, the parcel was mostly wooded in the last century. However, much of upper Davisville Road was open field farmed by the Portuguese immigrants who settled East Falmouth in the early 1900s. The four acres added to the preserve belonged to the family of Marianno and Rose Tavares, who built their home on Davisville Road in 1920. They grew vegetables and raised hogs and chickens there and also grew strawberries and turnips on 20 acres nearby. Like many of the Portuguese, Mr. Tavares worked a full-time job in addition to farming; he was caretaker for an estate on Penzance Point in Woods Hole.